Added on July 19, 2017 by Isabelle Brooks. NEW YORK, NEW YORK – AMERINGER | McENERY | YOHE is pleased to announce an exhibition of recent works by Suzanne Caporael. What Follows Here will open on 23 March and remain on view through 22 April 2017. A public reception for the artist will be held on Thursday 23 March from 6:00 to 8:00 PM. The exhibition is accompanied by a fully illustrated catalogue with an essay by Carter Ratcliff. For almost three decades, Suzanne Caporael has created spare but evocative paintings inspired by the natural world and the human desire to control it. In these palimpsest landscapes, she employs a minimalist aesthetic as the language of suggestion. The allusive shapes occupy quietly contradictory spatial realms, and—as with words in poetry—we encounter shifts in meaning. The richness of color and composition belie the problematic contradiction inherent in a deep love of place also haunted by an underlying narrative of loss. The paintings’ titles, implicit rather than descriptive, reveal an engagement with such questions. The large, cool blue- infused 719 (D. Balmori island) pays rapturous homage to the recently deceased architect Diana Balmori and her work on phytoremediation (the treatment of environmental problems through the use of plants). 720 (read the spill), with its seven-foot expanse of red, was inspired by the artist’s friend (a NASA scientist) and his daily updates on his exploration of an oil leak that has persisted for over twelve years. Naturalists say that the purpose of beauty is to call attention to its subject. Caporael concurs, and as a painter since early childhood, she brings the forces of skill and mature intellect to the process. Concise and incisively rendered with simple lines and shapes, her work has been called astonishingly lush. SUZANNE CAPORAEL was born in Brooklyn, NY in 1949, and has lived in twenty-five states. The artist earned her Bachelors and Masters degrees from the Otis Art Institute in Los Angeles, CA. She had her first show at thirty-five, when then Director Paul Schimmel debuted her work at the Newport Harbor Art Museum (now the Orange County Museum of Art). She was awarded a National Endowment grant in painting in 1986, and has been a visiting professor at the University of California, Santa Barbara and the San Francisco Art Institute. In 2009 she was a guest artist-in-residence at the Josef and Anni Albers Foundation. The artist’s prints are published in collaboration with Tandem Press, Madison, WI. Suzanne Caporael lives and works in Lakeville, CT with her husband, novelist, Bruce Murkoff. Added on October 17, 2013 by Isabelle Brooks. 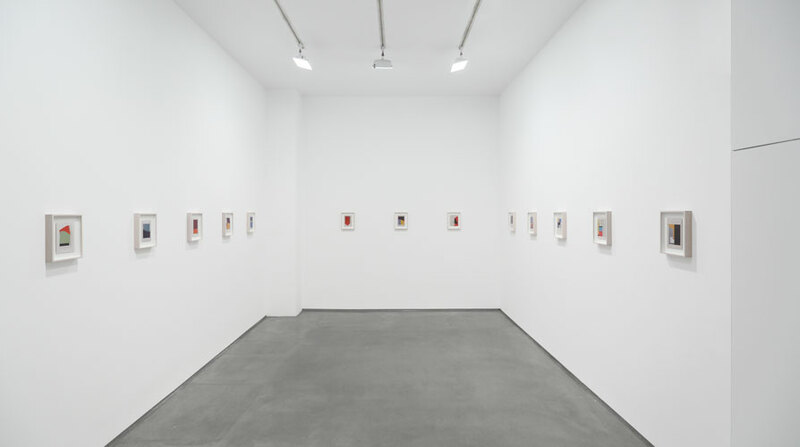 NEW YORK, NEW YORK – AMERINGER | McENERY | YOHE is pleased to present a group of works by Suzanne Caporael, Enough is Plenty. 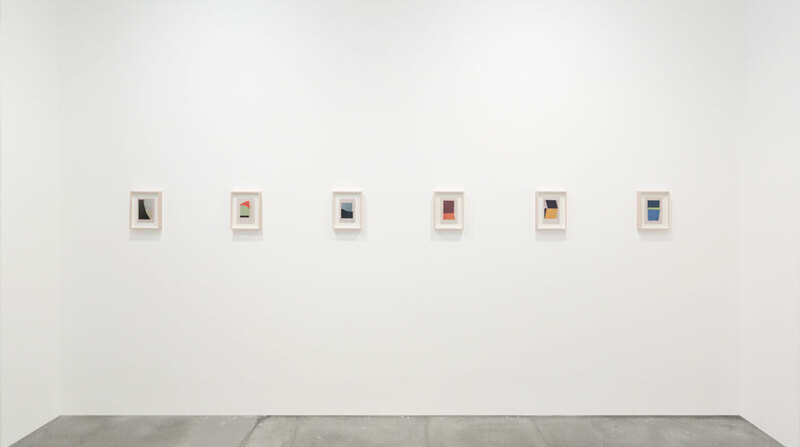 These studies, small paintings and collages, are representative of Caporael’s continued interest in the integration of visual cues – shape, color, contrast – as the prerequisite of perception. The content of individual works ranges from a single visual cue to a multiplicity of cues. Philosopher Alva Noë, in his preface to his book Action in Perception writes, “... perception is, I argue, a kind of thoughtful activity.” Caporael concurs, and through her work provides the impetus, while encouraging the viewer to take up the beholder’s share. SUZANNE CAPORAEL was born in New York in 1949. The artist’s work derives from close observation of the natural world and the attempts, scientific and cultural, to define and control it. Observation coupled with research has resulted in groups of works related to trees, chemical elements, water, ice, time, and place memory. Her current area of interest is the hierarchy of perception – the way in which the brain processes visual cues to construct a reality. The artist earned her Bachelors and Masters degrees from the Otis Art Institute in Los Angeles, California. She had her first show at thirty-five, when then director Paul Schimmel debuted her work at the Newport Harbor Art Museum (now the Orange County Museum of Art). She was awarded a National Endowment Grant in Painting in 1986, and has been a visiting professor at the University of California, Santa Barbara, and the San Francisco Art Institute. In 2009, she was a guest artist-in-residence at the Josef and Anni Albers Foundation. Her work is represented in many major museum collections including the Whitney Museum of American Art, New York, NY; The Museum of Contemporary Art, Los Angeles, CA; the Art Institute of Chicago, Chicago, IL; the Los Angeles County Museum of Art, Los Angeles, CA; the Milwaukee Art Museum, Milwaukee, WI; Legion of Honor, Fine Arts Museums of San Francisco, San Francisco, CA; the San Francisco Museum of Modern Art, San Francisco, CA; and the Yale University Art Gallery, New Haven, CT, among others. The artist lives and works in Bangall, New York, with her husband, novelist Bruce Murkoff. Added on November 15, 2012 by Isabelle Brooks. Added on October 21, 2010 by Isabelle Brooks. New York, New York - Ameringer | McEnery | Yohe is pleased to announce an exhibition of paintings by Suzanne Caporael in this, her third exhibition based on a series of road trips through America. Suzanne Caporael: The Memory Store, opens on October 21st and will be on view until December 4th. A public reception will take place on Oct. 21, from 6 p.m. to 8 p.m. The artist will be present. Congruent with an ongoing study of visual cognition and recollection, Caporael has traveled over 30,000 miles of American roads in order to expose herself to the revelations and experiences of the United States, a country she refers to as “an impenetrable abstraction.” On the back roads, memorial plastic wreaths abound, as do barely disguised missile silos, and signs for “Neapolitan Mastiffs,” “Flemish Giants” and “New Yorkies” (dogs, rabbits and puppies, respectively). A virgin pastoral landscape can, at any turn, explode into the aggressive splendor of a string of strip malls. Horses stand idle in pastures, Indiansride ATVs, and statues of Mary cavort with Disney’s Seven Dwarfs on front lawns. Caporael’s interest lies in what we make of what we see. In reference to a previous series of paintings, Time, (2004-2006) Caporael quoted physicist J.T. Fraser: “Space is the vessel of time.” But as we know, time robs memory of the details. In The Memory Store the painter presents us with the sensation of futility and the pleasure of the effort to hold on to recollections. The spare arrangements and unrepentant ambiguity imply a procedural distance with purpose. The occasional “recognizable” shape or line prompt contemplation, while the paintings physical contradictions between hard edges and the subtle erosions of boundaries encourage the reassembly of the elements to the viewers own memory store.